If you’ve ever seen a geode, you know that it looks really, really boring on the outside. Just a frumpy little rock doing its frumpy rock thing. However, when you open up the geode, it’s full of all sorts of shiny sparkles! Beautiful sparkling crystals fill the inside, undiscovered. All that needs to happen to turn frumpy rock into shiny sparkles is to crack it open. 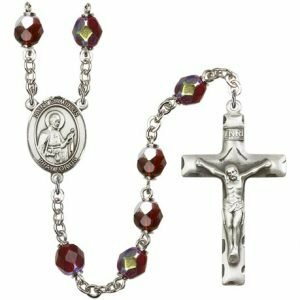 St. Camillus was sort of like a geode. His youth was not spent in the most holy of fashions, although not quite as “extravagant” as St. Augustine’s. He was a young soldier with a serious gambling problem. So what kind of crystals could he possibly hold? St. Camillus’s mother died when he was very young, and his father barely conceded his existence. At seventeen he contracted a disease in his leg that left him with an incurable sore. 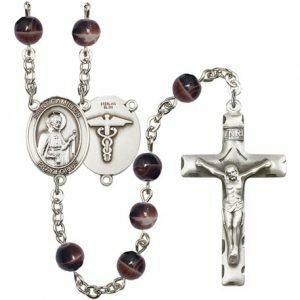 He went to Rome to be both patient and servant at the St. James Hospital for Incurables. After nine months, he was dismissed for being a quarrelsome gambler. So he joined the army. He fought against the Turks, first for Venice, then for Naples. He gambled and fought until his regiment was disbanded in 1574. He was twenty four years old, unemployed, and penniless. With nothing but the clothes on his back and a penchant for gambling, Camillus accepted work at a building belonging to Capuchin friars in Manfredonia. And the chisel started chinking away at the rock face. Camillus’s rocky covering got a great crack in it after an exhortation by the guardian of the Capuchins began his conversion. 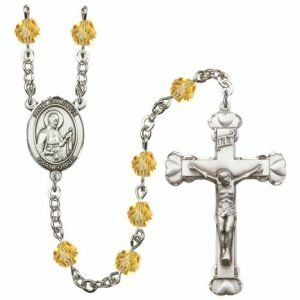 From that point on, Camillus never strayed from his penitential path. He entered the Capuchins as a novitiate, but was unable to be admitted because of the sore on his leg. He went back to Rome, to the same hospital that he had been dismissed from, and cared for the sick and dying with scrupulous attention. He gave them every spiritual help he could. His prudence, piety, and dedication impressed the administrators so much that they made him director of the hospital. Camillus wanted to form his own order for helping the sick, but was met with many obstacles. On advice from friends, including his spiritual director St. Philip Neri, he studied for the priesthood in order to better serve the spiritual needs of the sick and to overcome some of the obstacles in his way. He was ordained in 1584, at age thirty four. After his ordination, he left St. John’s Hospital of Incurables and founded his congregation, Fathers of a Good Death, also known as Servants of the Sick. The men in his order took vows to serve prisoners, those with plague, and those dying in private homes. The members of his congregation would make the patient’s bed, treat them with love in everything they did, and prepare them for the last sacraments and a happy death. 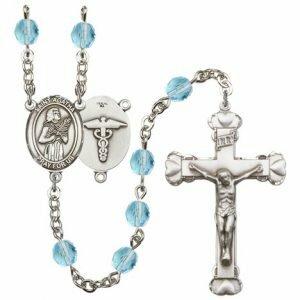 Camillus made it a chief end of his establishment to procure for the sick all spiritual assistance- encouraging them to acts of virtue, reading with them, and praying for them, among other things. 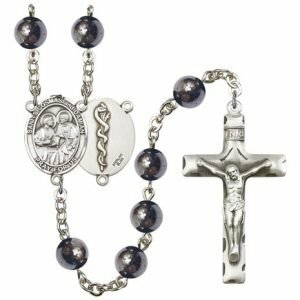 With this end in mind, he gave his priests devotionals particularly focused on penance and the sufferings of Christ and taught them phrases from the psalms and from other devotions that were most suitable for the sick and dying. Camillus was particularly attentive to the dying, for it is in the last few moments of a soul that it is in most danger of being lost for eternity. 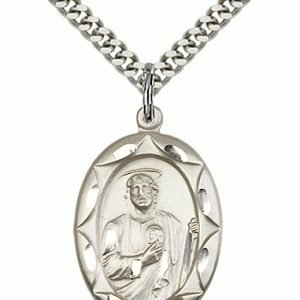 He taught the dying to make their death a sacrifice of themselves to the divine will in satisfaction for sins, and he helped them receive their last sacraments with faith, hope, and divine love. When he learned that people in hospitals were being buried while they were still alive, he instructed his religious to keep praying for the souls in agony for fifteen minutes after it seemed as though they had passed away. Two years after his congregation was confirmed by Pope Sixtus V, they formed a house in Naples. Camillus and his religious went out onto plague ridden galleys forbidden to land. Two of the religious became the first martyrs of charity in the order, for they died from the plague, contracted when they were caring for the sick on the ships. After the congregation was confirmed a religious order by Pope Gregory XV, some of the religious formed the first recorded military field ambulance, going with the troops fighting in Hungary and Croatia. Camillus was plagued with the sore on his leg that kept him from joining the Capuchins for forty-six years. He suffered many other ailments, including a rupture which he suffered for thirty-eight years and callous sores on the sole of his foot. He refused to let any of his religious care for him, instead sending them out to the poor sick and dying in the hospitals, prisons, and homes. Even in his last years of illness, Camillus would crawl from his bed to other patients’ beds to encourage them to do acts of virtue and see if they needed anything. Camillus had opened up to show beautiful crystals of charity through his work with the sick and dying. 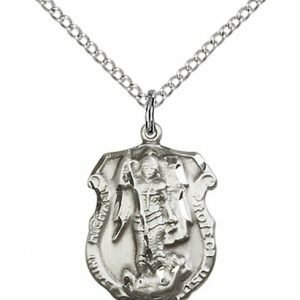 He shone with the polish of confession and discipline. 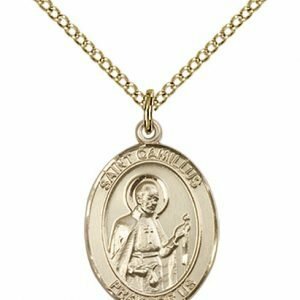 Camillus died on July 14, 1614 at sixty-five years, one month, and twenty days old. He was buried near the high altar in St. Mary Magdelen’s church, and later moved under the altar. St. Camillus has been named, along with St. John of God, the patron of hospitals, nurses, and the sick. Allowing God to use difficulties and setbacks to bring about good requires great faith, trust, and an openness to His will. St. Camillus de Lellis, once struggling with addiction and anger, placed himself in God’s hands, thus giving him the strength and means with which to provide help, healing, and hope to the sick. The life of St. Camillus de Lellis is a reminder that even though a situation may seem dismal, for God, all things are possible. St. Camillus de Lellis was born May 25, 1550 in Bucchianico, Italy. His father was an officer in the French and Neapolitan armies, and was rarely home with his family. 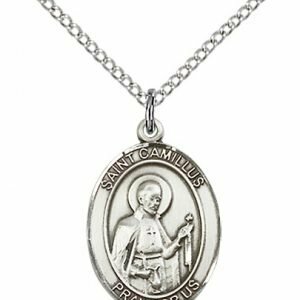 St. Camillus’ mother was nearly fifty when she bore him, and when she saw that St. Camillus had his father’s hot temper, felt unable to take care of him. In 1562, when St. Camillus was only twelve years old, his mother died. He went to live with relatives; however, they did not provide the love and attention he so needed. At age sixteen St. Camillus decided to join the army alongside his father, and went to battle against the Turks. 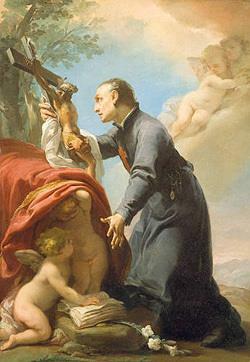 St. Camillus moved to Rome to live at the Hospital of St. James, which took care of incurable patients. While living there, he became the caregiver at the hospital, and later the director. His daily life was filled with many penances, including wearing a hairshirt. 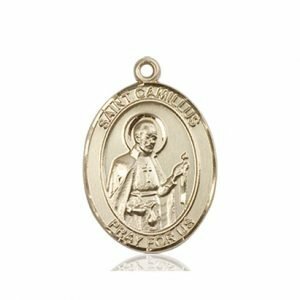 At this time he took St. Philip Neri as his confessor and spiritual director. 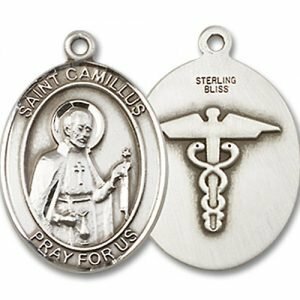 St. Camillus was bothered by the poor treatment the sick received from the staff at the hospital and felt called to make improvements. He gathered some young men who felt the same way – that all people, sick or well – deserve to be treated with dignity and respect. 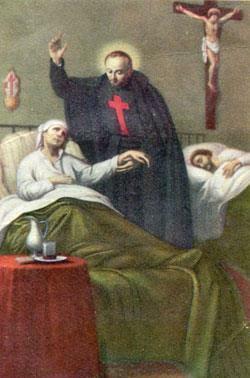 At St. Philip Neri’s suggestion, St. Camillus began to establish a religious order dedicated to the care of the sick. He began to study for the priesthood, feeling that he should receive Holy Orders before establishing this new religious community. He was ordained on Pentecost in 1584. 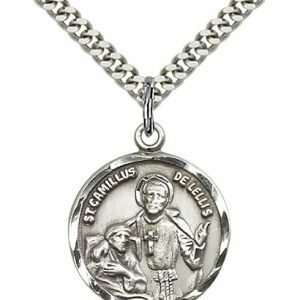 The new order founded by St. Camillus was named the Order of Clerks Regular, Ministers to the Sick (abbreviated M.I.). They became known as the Camillians, and wore black cassocks with a large red cross on the front. 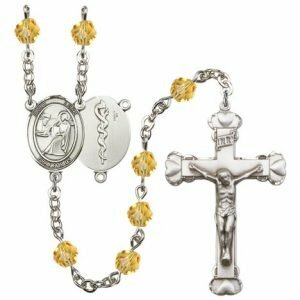 Because St. Camillus had served in the army, he was familiar with the need for medical care on the battlefield. 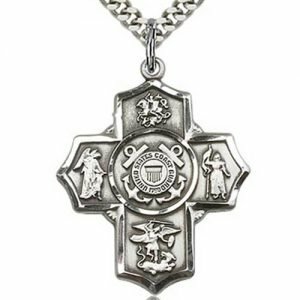 The red cross of the Camillians became a symbol of charity and service, hundreds of years before the International Red Cross Organization was established. 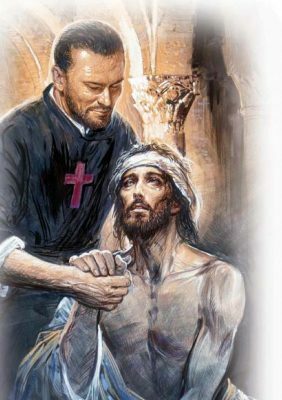 St. Camillus’ focus was always on the sick, making sure that they were being treated as if each of them were Jesus Christ Himself – with the utmost love, care, and respect. Once, when feeling discouraged, St. Camillus said that he heard the voice of Christ ask him “Why are you afraid? Do you not realize that this is not your work, but Mine?” It was this message that gave him the strength and confidence needed to open hospitals all over Italy, where members of his community would continue the work he had begun, caring for the sick and dying. 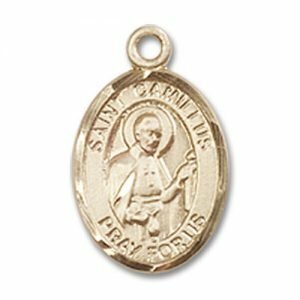 As St. Camillus grew older, the injury on his leg continued to cause him pain. In addition to this, he suffered from abscesses on his feet, making standing and walking difficult. 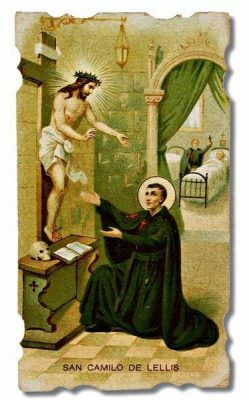 However, St. Camillus would not allow his infirmity to prevent him from the care of the sick, and would crawl to their bedside if walking was unbearable. He would not allow his illness to prevent him from sharing his love with those he saw as the suffering Christ. 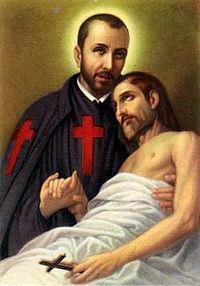 St. Camillus died on July 14, 1614. His body was entombed in the Church of St. Mary Magdalene in Rome. This church had previously been given to his order by Pope Sixtus V in 1586. The Camillians still maintain this church to present day. 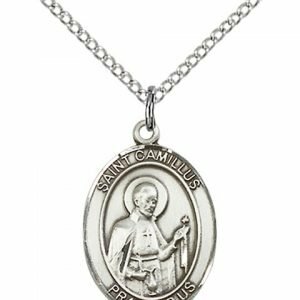 Pope Benedict XIV beatified St. Camillus in 1742, and in 1746, he was canonized a saint. His feast day is July 18. In addition, there is a scapular of the Order of St. Camillus de Lellis which is worn as a sacramental by many lay Catholics, in addition to Camillians. The origin of the scapular comes from an image of the Virgin Mary, Help of the Sick, painted by Dominican painter Fra Angelico. In 1860, in the Church of St. Mary Magdalene, a confraternity was created, developing this scapular as their own. The scapular is black and features the Virgin Mary on the front, with St. Joseph and St. Camillus at her feet, while the red cross symbolic of the Camillian order is on the reverse side. Indulgences have been granted to wearers of this scapular by Pope Pius IX and Pope Leo XIII. St. Camillus de Lellis is the patron saint of the sick, nurses, doctors, and healthcare workers. 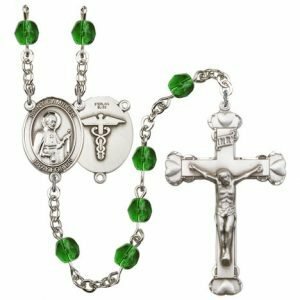 Because St. Camillus devoted his life to the care of the sick and dying, his intercession is sought by those who are themselves suffering, as well as by those who treat and provide care for them. St. Camillus de Lellis is portrayed in art as a man wearing a black cassock with a red cross on the front. In some depictions he is holding a sick person (often bearing the image of Jesus), while in others he is kneeling before a crucifix in prayer. 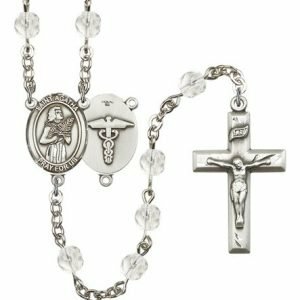 In these images the sick may be in the background, serving as a reminder of the mission of St. Camillus. Most wonderful Saint, your compassion for the sick and the dying led you to found the Servants of the Sick. As the Patron of nurses and hospital workers, infuse in them your compassionate spirit. Make hospitals resemble the inn in Christ’s Parable to which the Good Samaritan brought the wounded man saying: “Take care of him and I will repay you for it.” Amen.